NOTES: Saturday's home run total of 15 combined homers set a new Frontier Field record... The Wings had 22 hits, the first time since July 12, 2007 here against Indianapolis...The combined run total of 38 tied the ballpark record, 38 runs on April 29, 2004 when Buffalo beat the Wings 25-13. 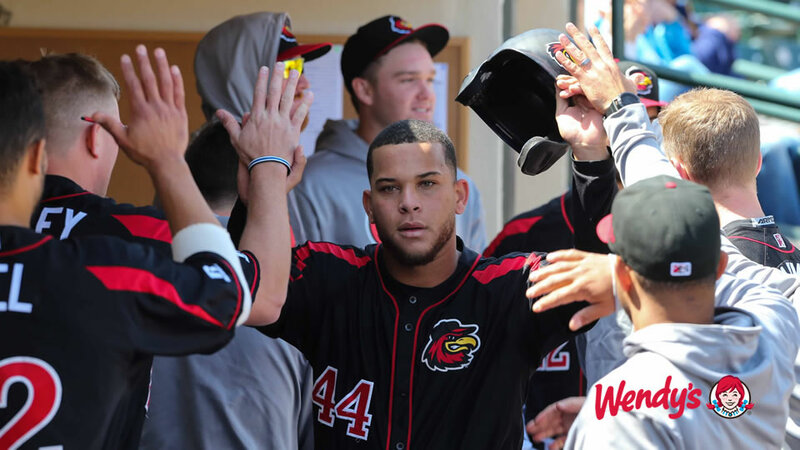 2017 - Jose Berrios allowed one unearned run on four hits with six strikeouts over eight innings and Bengie Gonzalez drew a bases loaded walk in the 10th inning as the Rochester Red Wings beat the Buffalo Bisons 2-1 Thursday afternoon at Coca-Cola Field. 1932 - In an attempt to emulate the success of Branch Rickey's St. Louis Cardinals farm system, Yankees owner Colonel Jacob Ruppert started his own chain of farm clubs by purchasing the IL's Newark Bears following the 1931 season. Colonel Ruppert occupies a box seat on Opening Day at the newly named "Ruppert Stadium", along with 13,000 fans in 28-degree weather as the Bears make their debut in Yankee pinstripes. Trailing Toronto 5-1 in the bottom of the 9th, the Bears rally to tie it with a grand slam homer before going on to win the game in the 10th. "No World Series the Yankees ever won gave me a greater thrill," exults Ruppert, "…and they call it Minor League Baseball!" Newark would go on to a 109-59 season, winning the team's first pennant in 19 years.